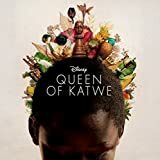 Accueil Produits Bande originale La bande originale de “Queen of Katwe”. La bande originale de “Queen of Katwe”. Film : Queen of Katwe. 1. #1 Spice (par HAB et Young Cardamom) – 3:50. 2. Sekem (par MC Galaxy) – 3:58. 3. Budo ! – 2:05. 4. Tuli Kubigere (par A Pass) – 3:17. 5. Bomboclat (par Jose Chameleone et Weasel) – 3:45. 6. Brian, My Brother ! – 1:00. 7. Skelewu (par DaVido) – 3:09. 8. Juicy (par Radio And Weasel) – 3:46. 9. It Is Fine – 1:03. 10. Engoma Yange (par Nsubuga Saava Karim) – 4:26. 11. Wuuyo (par A Pass) – 4:21. 12. Oswadde Nnyo (par Afrigo Band et Moses Matovu) – 3:29. 13. Mbilo Mbilo (par Eddy Kenzo) – 3:50. 14. Escape from Hospital – 0:57. 15. Nfunda N’omubi (par Afrigo Band et Joanita Kawalya) – 2:48. 16. Kiwani (par Bobi Wine) – 4:49. 17. The Promise of Harriet – 1:16. 18. Kyempulila (par A Pass) – 2:26. 19. Home Again (par Michael Kiwanuka) – 3:31. 20. Back to Life (par Alicia Keys) – 4:54.